Japanese Episode AG 011: "Guraena to Pochiena! Shinka no Shinpi!!" American Episode 283: "A Bite to Remember"
Haruka and Masato are observing a number of pokemon in the forest when they are confronted by a bunch of Guraena. 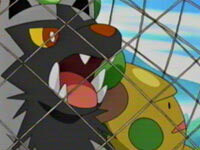 The dog pokemon attack, so Satoshi, Takeshi, and Haruka send out their pokemon to battle. A Pochiena enters the scene and starts to battle, but the fight is stopped by a young girl named Kakuri. Kakuri tells the young trainers that the area that they're in is a Pokemon Preserve and that they are not to catch any of the pokemon there. Masato inquires about the Pochiena, and Kakuri tells him that the little dog pokemon is the only one in its litter not to evolve. After being taught about the various types of pokemon evolution, Masato becomes determined to help Pochiena evolve. He starts by having it battle Haruka's Achamo, faking victories in hopes that it will help Pochiena evolve. When Haruka calls the strategy out as cheap, Masato begins looking for weak opponents so that Pochiena's first opponents won't be so difficult. Along the way, the Rocket-Dan appear and try to trick Masato with their pokemon evolution machine, but the young boy is able to figure out the scam. That doesn't stop the Rocket-Dan from kidnapping the Pochiena (along with a bunch of other pokemon from the forest) as they make off in their balloon. Masato pleads with the Pochiena to use its Bite attack to break through the net, and when it finally listens to the young navigator, it is able to free itself and all the other pokemon! After Satoshi-tachi finish the Rocket-Dan off, Pochiena begins to glow! Much to Masato's satisfaction, Pochiena evolves into Guraena! Having witnessed their first pokemon evolution, Haruka and Masato, along with Satoshi and Takeshi, leave the area to their next destination. This is the first time that dubbed Max has gotten on my nerves. I usually haven't had a problem with him so far. When I first saw AG 003, I was actually relieved that the little guy wasn't given the "Richie" voice that 4Kids seems to love giving to every male character under the age of ten. The "Max" voice is actually pretty rare in this series, and so far it's served its purpose pretty well. But for some reason, he just got on my nerves in this episode. Maybe it's because Masato is particularly annoying this time around (just WHY is he so determined to make Pochiena evolve when he's seen plenty of non-evolved pokemon before now?) but there's just something about him that annoyed me. The dub had a few script changes, but nothing that was unexpected. I actually liked some of the jokes Team Rocket made throughout the episode (like their references to Thomas Dolby and McGruff the Crime Dog) and it's nice that 4Kids gives some of us older folk a funny joke every now and then. The very first shot of the episode (the panning shot of the lake) has the first three seconds cut from it. Brock: "Ready for the test? Define pokémon evolution in an essay of nine thousand words. Ah, just kidding. That's all for today, class." Does the whole "dressed up in a lab coat and holding a brush and little wooden tablet against an Asian-looking mountain" thing seem a bit random to you? If it does, it's because the whole thing is a parody of the show's "Orchid-Hakase Pokemon Lecture" bit. You see, after the end credits of every episode, Orchid-Hakase has a segment where he talks about a particular pokemon. He usually states a couple of facts about the pokemon (like its attacks or temperament) before being attacked by the pokemon in question. The bit ends with Orchid-Hakase making up a senryuu (a less restrictive form of haiku) about the pokemon, usually containing a pun with the pokemon's name. Then you hear the little kabuki-esque *tok* sound. That noise is usually heard at the end of Orchid-Hakase's poems and signifies the end of the senryuu. Then, when Brock says "That's all for today, class," Takeshi says "Min'na mo pokemon Getto ja zo!" ("Everyone, go out and catch pokemon! "), which is the line that Orchid-Hakase uses to end every lecture. Jessie: "I can buy a new house!" James: "I can move out of Mom's!" Um, James...you remember this episode called "Holy Matrimony?" Y'know, the episode that revealed that you DON'T live with your parents because they're so crazy? Originally, the Rocket-Dan was saying their promotion schtick (more about that in the next comparison). When Meowth appears in his Azurill outfit, he says "Marril." This mis-identification doesn't occur in the Japanese version. The last three seconds (from the TO BE CONTINUED... screen) is cut.